We recently got a 3D printer. What an amazing space this is! I'm told we do have some very impressive 3D printers on campus. Some of industrial strength (and an equally industrial price tag). This is different. We got a PrintrBot Jr. V2. In looking at different makes and models, this one sits in the space of not too pricey, and not too small. 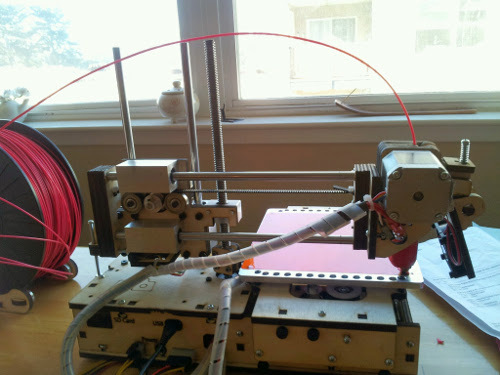 Additionally, PrintrBot is open source. Their story is equally interesting. Brook Drumm, the guy who runs Printrbot today, started the company as a project, to be funded on Kickstarter. They were shooting for $25,000. Instead, they got $830,827. Their plan was to use 3D printers to print more 3D printers. Evidently, it took a while to fulfill those orders. They've since grown into an outfit located in Lincoln, CA, producing laser-cut wood-based 3D printers in various sizes. We got the mid-sized PrintrBot Jr. V2. Apart from the open source aspect of these printers, and the open source nature of the designs (you can find thousands on sites like Thingiverse, mostly under Creative Commons licenses), 3D printers represent something amazing. In fact, the amazing-ness has little to do with the open source-ness (the open source nature addresses propagation, cost and easy access). Take a regular inkjet printer. It moves the paper in and out (think Y axis), and the printer cartridge deposits ink on the paper along a line (think X axis). Simple enough. When was the last time you got excited by an inkjet printer? Stood there, waiting for the printjob to finish? Yeah, the charm of XY printing is over. Passé. The joy of Z axis is something else. It raises the bar (no pun intended) on the excitement because now, you have something tactile. Something you can hold in your hand, run your fingers around. It feels real. Of course, the world is going the other way with smartphones and tablets, but nothing beats the real thing. All three axes are a must. I also have a distinct feeling that this kind of 3D printing isn't really about printing tea cups. It's about spurring creativity and innovation. It's about getting the gears in our minds spinning. It's about coming up with really useful implements such as printing umbilical cord clamps in Haiti. Printing in 3D is a learning experience. Types of plastic, extruder temperature, nozzle width, filament diameter, bed temperature, layer height, skirt, brim, infill, calibration, to name a few. Once you get past it though, its sheer joy. 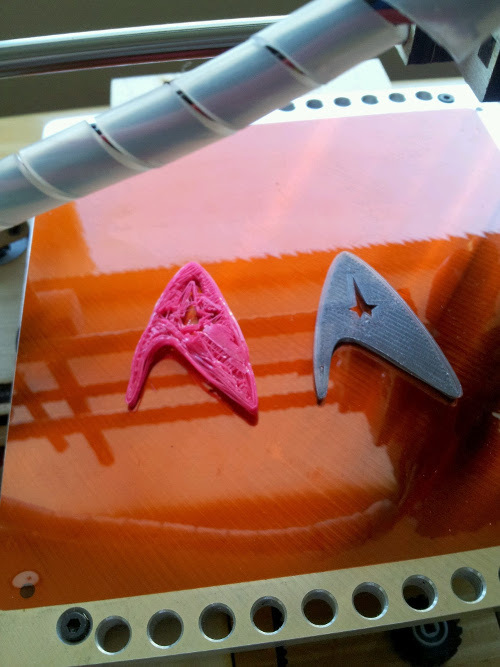 I was going to print a couple of calibration items, but decided to go with an old favorite: a Star Trek badge. Tweaking the calibration and layer height should get me better results. We are not quite there yet, where Picard can say "Tea. Earl Grey. Hot", but we aren't too far away!